The SoCal Honda Dealers kicked off a summer of helpfulness on Father’s Day with hundreds of free car washes and complimentary valet parking for Honda drivers to help residents save money, and give an extra thanks to dads on their special day. Honda drivers and dads were thrilled to receive free car washes and complimentary valet parking, but dads aren’t the only ones getting helped this summer by Helpful Honda! 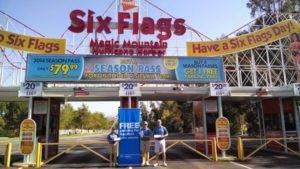 The Guys in Blue will be at Six Flags Magic Mountain every Friday through August, bringing helpfulness to thrill-seekers. On June 6th, the SoCal Honda Dealers successfully kicked off #HelpfulFridays by surprising 50 lucky Honda drivers with free parking and complimentary lockers! “I’m on a budget and the free parking really helped out. It’s the little things that have the most impact,” said one grateful Honda driver. “This is seriously the best day ever, and we haven’t even made it inside the gate. 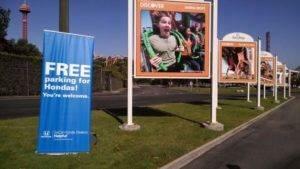 Thanks for hooking us up with the works: free parking, Bugs Bunny Bucks and who doesn’t like Bugs Bunny Bucks. Plus, a free locker. Honda Rules!” said another Honda driver. But the helpfulness didn’t stop there! Honda drivers also received helpful Bugs Bunny Bucks, or credits that can be used anywhere around the park for food, shopping, and more to help save thrill-seekers some money in the park. 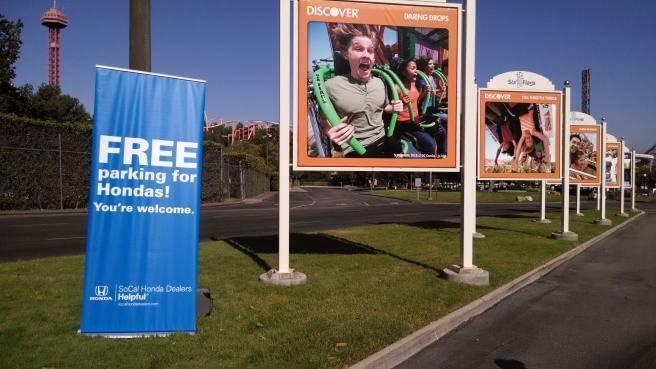 In addition, Honda drivers were given exclusive early admission into the Six Flags park, an hour before opening to the general public, to ride Goliath and Lex Luthor without the hassle of long lines! 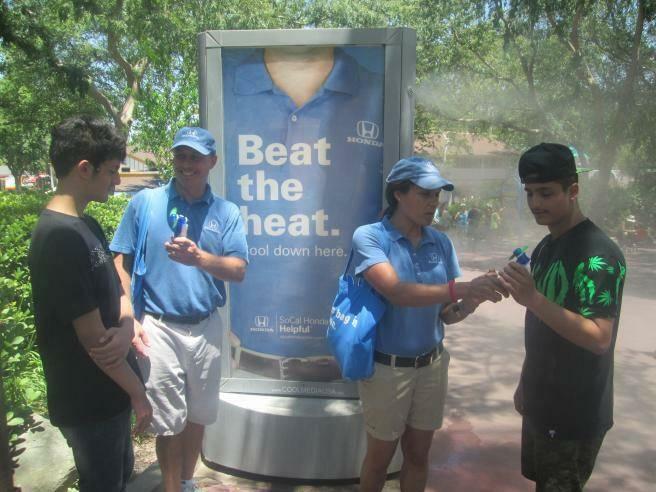 The Guys in Blue continued to spread helpfulness inside the park with complimentary summer essentials like hand sanitizer, lip balm, and misters to help park-goers beat the heat. 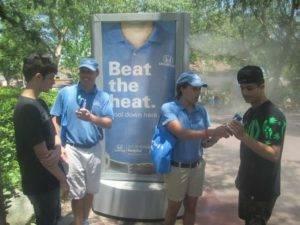 “The misters are perfect for this hot day. Now, can you guys also fan me and feed me grapes?” joked one park-goer who felt like royalty upon receiving the unexpected treat. 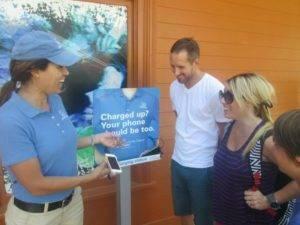 The SoCal Honda Dealers are also hosting convenient phone charging stations throughout the park to ensure guests stay fully charged. “Now we don’t have to wait in line at the Cyber Café to use the internet; I can just charge my phone!” said one guest, who was relieved to discover the helpful charging stations. Picking up trash, taking pictures for families, and giving directions to all the great dining, shopping, and attraction locations are other ways the Guys in Blue stayed helpful. Worried you missed out on all the helpful perks? Have no fear, #HelpfulFridays at Six Flags Magic Mountain will be taking place every Friday from now until August 29th, and the Guys in Blue have more helpfulness planned for SoCal residents this summer! For more information and up-to-date tips about #HelpfulFridays and the SoCal Honda Dealers, like us on Facebook at facebook.com/socalhondadealers or follow us on Twitter at @HelpfulHonda .